The first mech-switch keyboard from Logitech. Can it justify the wait? Surely it's only a matter of time before everyone gets on the mechanical keyboard bandwagon, though I'd have bet my house that Logitech would've gotten out there a lot earlier. 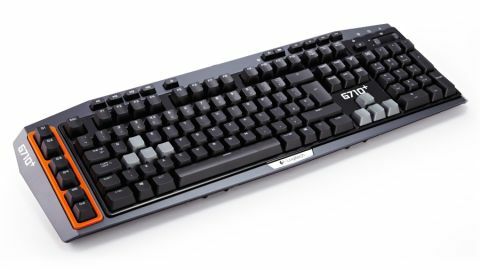 But no, this G710+ is the first keyboard out of Logitech's design-works with those lovely, chunky, noisy mechanical switch keys. Logitech was the maker of the first gaming keyboard I genuinely thought was a new direction in gaming tech. The G15, with its sky-high price tag and integrated LCD screen, came about at a time when most of us stuck resolutely with the beige keyboard that turned up with our first PC. It wasn't the fact that it came out with a raft of different apps for said screen, it was the way the community picked it up and ran with it that made us all sit up and take notice. That keyboard inspired countless others - most recently from Razor and Mad Catz with their touchscreen tech. It also inspired keyboard manufacturers to branch out because, if they got the tech right, they could charge whatever they wanted. Despite it's position as a keyboard technology leader, this is the first mechanical switch board from Logitech's gaming-focused G-series range. And thanks to its legacy, the company is able to add a crazy-high £150 price tag. Compared with either the Mad Catz STRIKE 7 or STRIKE 5 (at £250 and £175 respectively), the G710+ starts to look like reasonable money. That's until you realise actually you're not really getting much with the G710+ that you wouldn't expect in any £100 board. Corsair's impressive K90 comes with all the macro recording shizzle you could want for your MMO gaming, and the media controls that seem to come as standard too - all with a brushed aluminium base and mechanical switch keys. Granted there's no backlight, but that's about it. Putting price aside though, how does it perform? Well, as a gaming board it does all you could ask, and the mech switch tech is nicely responsive. The different levels and separate areas of LED backlighting are nice, though the grey WASD and cursor keys look like they were ripped off my old Commodore 64. The rolling volume control is a neat little addition, and is definitely my preferred method of enloudening my music. The separate gaming/desktop switch (essentially turning off the Windows key) is necessarily quick and simple to use, as are the macro and media buttons. My big problem is the action on the keys themselves, but I admit this is a personal issue. My preference is for long travel on mechanical switches, which demands deliberate action to depress them fully. I understand that a lot of gamers making the leap from membrane switch keyboards will want a more familiar tactile experience - just a lot more responsive. We have to come back to the price, though. I think anything over £100 is too much. The excellent Gigabyte Osmium is a basic mech switch, but comes with media controls, backlight and even a USB 3.0 extension port. That costs less than £100, and gets my vote over this.